). Protons are symbolically represented by red spheres, and neutrons by blue spheres. In nuclear physics and nuclear chemistry, a nuclear reaction is semantically considered to be the process in which two nuclei, or else a nucleus of an atom and a subatomic particle (such as a proton, neutron, or high energy electron) from outside the atom, collide to produce one or more nuclides that are different from the nuclide(s) that began the process. Thus, a nuclear reaction must cause a transformation of at least one nuclide to another. If a nucleus interacts with another nucleus or particle and they then separate without changing the nature of any nuclide, the process is simply referred to as a type of nuclear scattering, rather than a nuclear reaction. 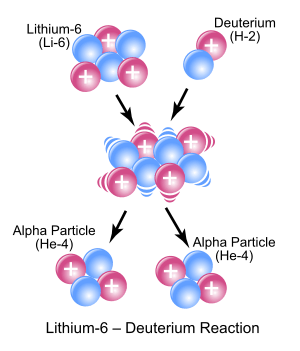 In principle, a reaction can involve more than two particles colliding, but because the probability of three or more nuclei to meet at the same time at the same place is much less than for two nuclei, such an event is exceptionally rare (see triple alpha process for an example very close to a three-body nuclear reaction). "Nuclear reaction" is a term implying an induced change in a nuclide, and thus it does not apply to any type of radioactive decay (which by definition is a spontaneous process). Natural nuclear reactions occur in the interaction between cosmic rays and matter, and nuclear reactions can be employed artificially to obtain nuclear energy, at an adjustable rate, on demand. Perhaps the most notable nuclear reactions are the nuclear chain reactions in fissionable materials that produce induced nuclear fission, and the various nuclear fusion reactions of light elements that power the energy production of the Sun and stars. Both of these types of reactions are employed in nuclear weapons. In 1917, Ernest Rutherford was able to accomplish transmutation of nitrogen into oxygen at the University of Manchester, using alpha particles directed at nitrogen 14N + α → 17O + p. This was the first observation of an induced nuclear reaction, that is, a reaction in which particles from one decay are used to transform another atomic nucleus. Eventually, in 1932 at Cambridge University, a fully artificial nuclear reaction and nuclear transmutation was achieved by Rutherford's colleagues John Cockcroft and Ernest Walton, who used artificially accelerated protons against lithium-7, to split the nucleus into two alpha particles. The feat was popularly known as "splitting the atom", although it was not the modern nuclear fission reaction later discovered in heavy elements, in 1938 by the German scientists Otto Hahn and Fritz Straßmann. This is a large amount of energy for a nuclear reaction; the amount is so high because the binding energy per nucleon of the helium-4 nucleus is unusually high, because the He-4 nucleus is "doubly magic". (The He-4 nucleus is unusually stable and tightly bound for the same reason that the helium atom is inert: each pair of protons and neutrons in He-4 occupies a filled 1s nuclear orbital in the same way that the pair of electrons in the helium atom occupy a filled 1s electron orbital). Consequently, alpha particles appear frequently on the right hand side of nuclear reactions. Neutrons, on the other hand, have no electric charge to cause repulsion, and are able to initiate a nuclear reaction at very low energies. In fact, at extremely low particle energies (corresponding, say, to thermal equilibrium at room temperature), the neutron's de Broglie wavelength is greatly increased, possibly greatly increasing its capture cross section, at energies close to resonances of the nuclei involved. Thus low energy neutrons may be even more reactive than high energy neutrons. Fusion reactions — two light nuclei join to form a heavier one, with additional particles (usually protons or neutrons) thrown off to conserve momentum. Fission reactions — a very heavy nucleus, after absorbing additional light particles (usually neutrons), splits into two or sometimes three pieces. This is an induced nuclear reaction. Spontaneous fission, which occurs without assistance of the neutron, is usually not considered a nuclear reaction. At most, it is not an induced nuclear reaction. The reaction 14N(α,p)17O performed by Rutherford in 1917 (reported 1919), is generally regarded as the first nuclear transmutation experiment. 9Be + n → 2α + 2n can contribute some additional neutrons in the beryllium neutron reflector of a nuclear weapon. Either a low energy projectile is absorbed or a higher energy particle transfers energy to the nucleus, leaving it with too much energy to be fully bound together. On a time scale of about 10−19 seconds, particles, usually neutrons, are "boiled" off. That is, it remains together until enough energy happens to be concentrated in one neutron to escape the mutual attraction. Charged particles rarely boil off because of the coulomb barrier. The excited quasi-bound nucleus is called a compound nucleus.